While we love us some crazy French cars (the Matra Bagheera and Citröen SM spring to mind), we still can't help but wonder what incomprehensible motivations led any American to purchase a brand-new 505 as a transportation car back in 1985. Sure, they were nice cars to drive, but... well, we all know the rest of this rant by heart. Now, you European readers are probably asking "What's the big deal about spotting an 80s 505 on the street?" It was a rare occasion when you caught sight of one of these things here even in the 80s, you see. 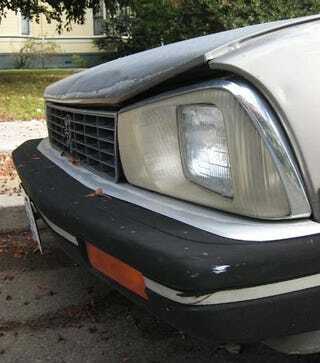 Peugeots never sold well in the US of A; there was a brief period in the mid-70s when they sold just enough of them here to establish a firm connection between the words "Peugeot ownership" and "rapidly emptying wallet" in the popular imagination. These days, any American under 25 looking at that emblem is going to be mighty puzzled about what the hell it stands for. This car is actually in pretty decent shape, but the temporary registration sticker in the rear window tells the whole story; it's probably not possible to get it to run well enough to pass the smog test. Hey, isn't that another Peugeot parked in front of this one? That tells us that the hapless owner believes that Peugeots are actually great cars, in spite of the pain they cause him or her every day. Best cars ever made, monsieur! Pretty cool-looking wheels on this car. What do you want to bet the bolt pattern uses some totally oddball proprietary spacing? I'm surprised the lugnuts aren't heptagons, requiring a special 7-sided wrench.